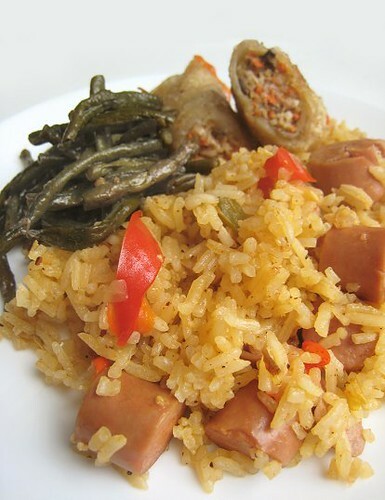 Looking at recipes of Cuban food, I can't help noticing how similar some of the Cuban dishes are to Filipino dishes. This is not surprising, as both the Philippines and Cuba have a shared Spanish colonial history and a similar American "liberation" period. Which I suppose explains the fascination with canned vienna sausages. We grew up on Purefoods (a Philippine brand) Vienna sausages. In desperate times and not-so-desperate times, a tin can of Vienna sausages would tide us over to the next meal. 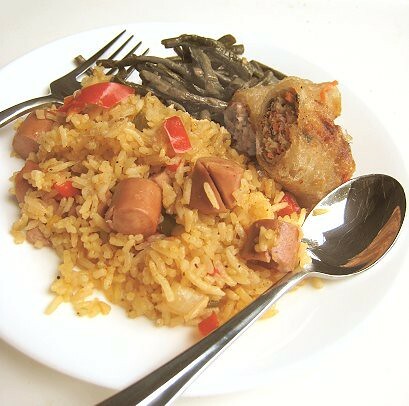 We usually pan-fried these sausages to develop a crispy crackle on the outside, and we would eat them sometime with eggs, sometimes with garlic rice, sometimes with "tasty" bread (which was what we called soft, white bread). 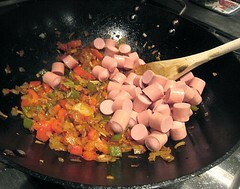 However, I don't remember our Philippine Vienna sausages having the flavour of smoke. 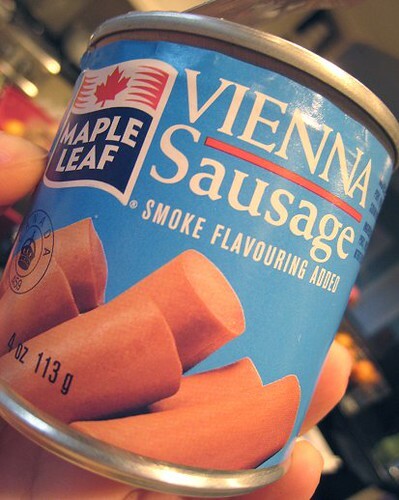 In fact, when I first tasted these Maple Leaf sausages oh-about-two-decades ago, I recoiled because the smoke flavour was just overwhelming. Time is such a great equalizer and I don't mind these Maple Leaf ones as much. I don't eat them that often, though, so I suppose that might have something to do with not minding them as much. 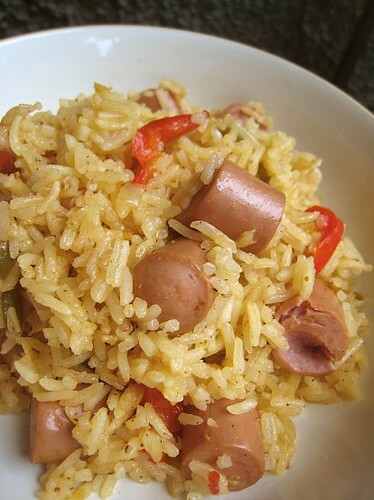 I'm not a Vienna sausage fanatic, but for some inexplicable reason, arroz con salchichas spoke to me. I have even taken to calling it my "fantasy recipe." Granted, it did take me almost a year until I finally made it, but I was as excited as could be once I realized I could make this dish for our Regional Recipes entry. I skipped to the kitchen, clapping my hands, and started my fantasy recipe. 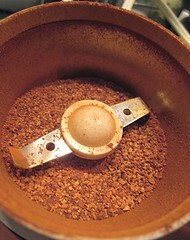 The recipe called for annato (achiote) powder. We've used up the last of ours making another pot of kare-kare recently (delicious! 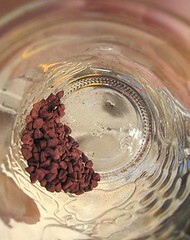 ), so I decided to grind up some whole annato/achiote seeds. 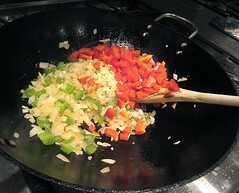 To start, some onions and green peppers sweated it out in our wok, followed by garlic and red peppers. 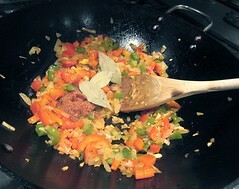 The seasonings were next: ground achiote/annato, cumin, and dried bay leaves. 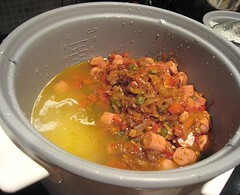 I used 3 4-oz cans of Vienna sausages, each sausage cut into thirds. Those went in last. 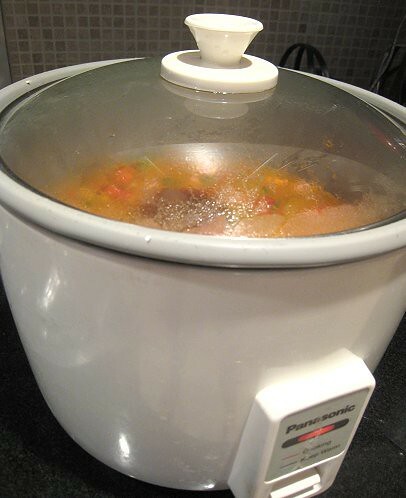 Next, the magic of the rice cooker! For people who haven't used rice cookers before, they usually come with a little cup for measuring raw rice. 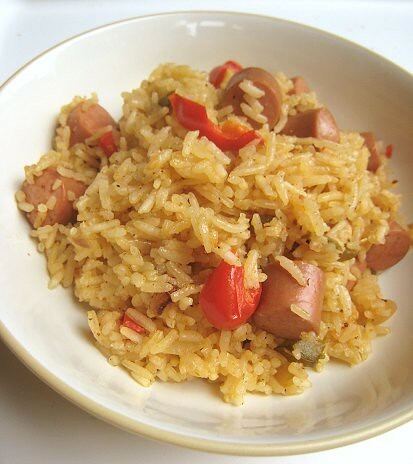 Then, it's a simple matter of filling the cooker with rice, then pouring in water until it reaches the appropriate level. There are grooves on the inside of the cooker for this purpose. Using 4 "cups" of rice? Pour the water until it reaches the "4" line. Nathan's recipe called for 3 cups of rice. Since the standard "cup" size for our rice cookers is actually 2/3 cup, I used 4 rice-cups. 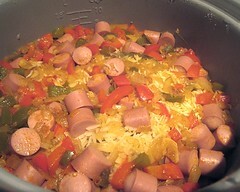 I measured this all out, then added the Vienna sausage mixture. I pushed the switch to "cook" and the rice cooker did all the work. After that little "click" from the rice cooker, it was done. Following Nathan's example, I ate this with some leftovers: my mother's soy-braised long beans and some Vietnamese fried spring roll from a nearby eatery. Well, the spring roll was just for show. The wrapper didn't really fare well after a night in the refrigerator. Seeing the wok and its bell peppery residue, JS and I thought it was the perfect time to make shakshuka (post is here!). 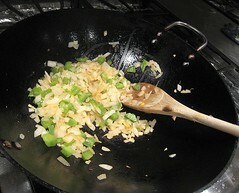 If I had to wash the wok, I might as well use it one more time before doing so, right? So, I ate the rice with long beans and my shakshuka (not pictured). Our rice didn't turn out as yellow as Nathan's, probably because of my achiote; perhaps they weren't ground fine enough. But, I don't think that the dish suffered because of it. We're quite happy to have discovered a piece of Cuban home-style cooking. As with home-style dishes, this one hit the spot. Up next, a Cuban treat that we've almost forgotten. We gorged on these several years ago during a trip to LA. The region for this edition is Cuba. The round-up will be hosted at Blazing Hot Wok and will be posted after November 15.
haha! This dish is speaking to me. 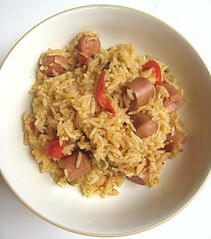 But then again, I'm also a fan of hotdogs in my fried rice. And can you believe, I always wondered what those numbers on my rice cooker were supposed to mean. My mom always taught me to measure the water using my finger. That is, the level of the water should be just past your first joint when your index finger sits right on the surface of the rice. So scientific, huh? This sounds like an excellent dish. 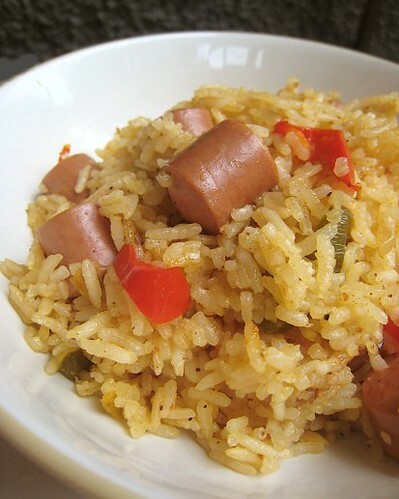 I love that you made it in a rice cooker - so easy! This rice seems perfectly spiced. An excellent tribute to Cuban cuisine. Hahaha... I guess it's different if one grows up with them. Teehee. I'm always afraid to do the finger method of measuring! Oh yeah, we love our rice cooker.